Big Daddy would have been doing his fake cry with the hanky today at the site of the burger joint we went to today for lunch. 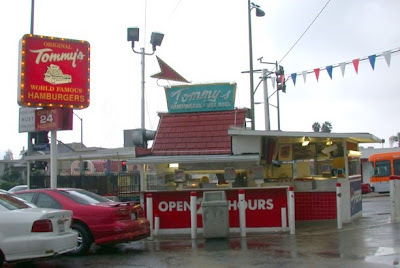 We ate at Tommy's World Famous Hamburgers. This was far and away the sloppiest hamburger I have ever eaten. These aren't just burgers either, they are super greasy, cheese, chili burgers, but they are oh so good. Also, no tables; you stand and eat. I suppose the grossest part was watching them take the fried burgers off of the grill and dragging all of the grease off with the spatula. Literally a pool of grease. Other than that, the weather has been gorgeous. The city is quite different from NY, but I haven't had a whole lot of time to explore. Maybe tomorrow.